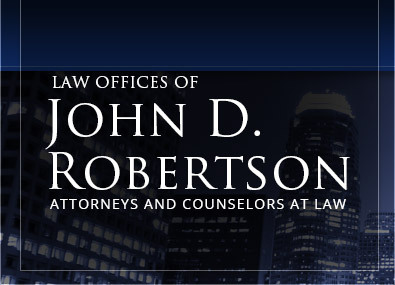 John D. Robertson is the founder and principal attorney with the Law Offices of John D. Robertson in Los Angeles California. John D. Robertson's practice focuses on vigorous litigation and advocacy, including criminal defense, federal criminal defense and white-collar matters, civil litigation, and negotiation of contractual matters and disputes. John D. Robertson has an extremely strong educational background from two of this country's most prestigious institutions of higher learning, as well as many years of extremely varied and diverse experience in the practice of law. He regularly tackles tough and complex issues, and successfully resolves problems where others have failed. John D. Robertson enthusiastically accepts challenging cases, and prides himself on serving as a determined and tenacious advocate who is a detail-oriented, trusted, down-to-earth and common sense advisor to his clients. Mr. Robertson is a 1976 graduate of Boalt Hall School of Law at the University of California Berkley, and strives to practice in an excellent manner consistent with that Ivy League school's legacy. Mr. Robertson has over 35 years of experience in civil litigation and criminal defense. Mr. Robertson launched his legal career and training as a Deputy City Attorney for Los Angeles. There, he went through an extensive training program in the trial of cases and the prosecution of matters on behalf of the city of Los Angeles. Mr. Robertson then worked as a Deputy Public Defender with the Los Angeles County Public Defender's office for a period of time, defending clients (including juveniles), against all manner of serious criminal accusations and cases, gaining even more experience and further sharpening his skill in litigating, trying and handling different cases. Thereafter, Mr. Robertson began a significant career as a federal prosecutor, serving for years as an Assistant United States Attorney in Los Angeles, California. During his tenure as an Assistant United States Attorney, Mr. Robertson prosecuted very complex, substantial, significant and wide-ranging federal cases, including complex white-collar criminal matters. Subsequently, Mr. Robertson accepted a position as an Associate in the civil law firm of Lewis, D'Amato, Brisbois and Bisgaard in Los Angeles, California. While at Lewis, D'Amato, Brisbois and Bisgaard, Mr. Robertson specialized in civil litigation and the defense of attorneys who had been sued for legal malpractice in a wide variety of underlying civil matters. Mr. Robertson worked in all phases of that litigation, as a "lawyer's lawyer", providing his services and expertise to numerous attorneys, practicing in many different areas of the law. This experience allowed Mr. Robertson to get very acquainted with the business of law practice, as well as with the underlying issues which were the underpinning of the various professional liability cases he was handling. Mr. Robertson left Lewis, D'Amato, Brisbois and Bisgaard in the early 80's to realize the dream of starting his own practice. Mr. Robertson has been in private practice since, and over the years has defended a varied amount of clients in very sophisticated and significant matters. Mr. Robertson is comfortable and articulate in the courtroom, and as an experienced, tenacious advocate, both in terms of complex civil litigation and serious criminal defense. Mr. Robertson has also negotiated contracts, represented individuals in connection with extensive and on-going Grand Jury and criminal investigations, and has been involved in a wide variety of civil litigation matters over the years. Mr. Robertson is a member of the California bar, and is also licensed to practice in federal courts throughout the country. Mr. Robertson is a member of the National Association of Criminal Defense Lawyers, as well as a member of the Criminal Law section of the State Bar of California, where he formerly served as chairperson of the Federal Courts Subcommittee. Mr. Robertson is a former Grader/Reader for the California Bar Exam, as well as a teacher of a course on contract law and analysis to Bar Exam candidates for a program established by a Federal District Court Judge. Mr. Robertson is also active in federal court matters in the Central District of California, and has attended numerous seminars and training programs in litigation and in criminal defense, both state and federal. Mr. Robertson graduated from the University of California at Los Angeles, with a B.A. degree in Political Science, receiving the award of Departmental Highest Honors upon graduation. Mr. Robertson then attended law school and obtained his J.D. degree in 1976 at the University of California at Berkeley (Boalt Hall), where he was ranked in the top of his class and was an Assistant Editor of the law journal, the California Law Review, where he published an article on insurance coverage litigation and liability. Mr. Robertson was admitted to the California Bar as an practicing attorney in 1976 immediately upon his graduation from Boalt. Although having defended others for the last 30 years against government abuse, over reaching and injustice, Mr. Robertson has indeed worked on all sides of the law, having experience both as a criminal prosecutor, and as an advocate for others, as a criminal defense attorney and civil litigator. This very, very broad litigation and legal experience over many, many years from various perspectives, has given him a strong strategic advantage over his opponents, distinguishing him and setting him apart from the vast majority of attorney colleagues. Mr. Robertson is a prolific and avid reader of nonfiction, a frequent international traveler, a news and current affairs aficionado, and an enthusiastic exerciser and fitness buff. Mr. Robertson lives in the Los Angeles, California area. Mr. Robertson is 1976 graduate of Boalt Hall.